The PMAG is a 30-round 5.56x45 NATO (.223 Remington) AR15/M16 compatible magazine. It features an advanced impact resistant polymer construction and an easy to disassemble design with a flared floorplate for positive magazine extraction from pouches. The PMAG 30 utilizes a resilient stainless steel spring for corrosion resistance and a anti-tilt, self-lubricating follower for increased reliability. Note that the MOE version of Gen M2 PMAGs does not include the dustcover. These are now sold separately and still work perfectly fine with this generation. 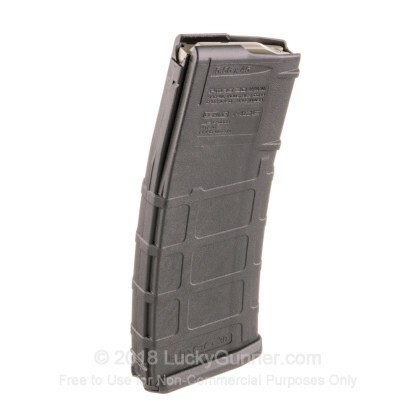 Please check your state laws on hi-capacity magazines prior to placing your order! Got a 30 round Magpul for my Springfield Saint. Worked great and great price from LG! Amazingly fast shipping - literally shipped 3 hours after placing an order. I order 1 everytime I buy ammo to stock up before large capacity magazines are banned. 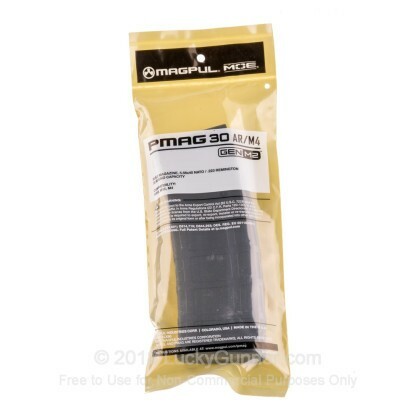 Magpul mags are a quality product, Lucky Gunner provides a great price! Bought for Panther firearms AR works great. A lot better than the metal. Love these magazines! What can I say they are Magpul. Easy ordering and fast shipping. That's why I will always buy from Lucky Gunner. These mags operate flawlessly. They look great and work great! Item as described, shipped and received when stated, good value. I had previously purchased some knock-off brand 30rd magazines and found them inferior. These Magpul AR-15 magazines hold the rounds without spontaneously spitting your ammo back out while stored. These mags are the same as the one that came with my new S&W AR-15 great quality ! Will buy again! Magpul makes the best AR-15 magazines. Period. I've had zero stoppages in my rifle with PMAGs. LuckyGunner has an excellent website: no price gouging and no back orders. What you see is what you get. I placed my order for these magazines on Thursday night (7PM) and they arrived early Saturday morning. Can't beat that! These mags have yet to fail on me. The price could be better, but still a good value. Works perfectly. Waiting for prices to drop to purchase more. These magazines are light, strong, and function perfectly! Could be cheaper but they r in demand! Great quality Magazine. Does not latch up in the HK MR556A1. Gave it to my friend with AR platform and he loves it! Works great. I marked it for bad performance because it didn't fit my weapon system. It performs 5 stars in the right weapon. Great product, and easy to use and clean. Even though they don't come with the dust/impact covers anymore, I still would use them over steel mags any day. The prices are fair, service was great, and I will continue to shop w Lucky Gunner. Q: Do these ship to upstate NY? A: Hi Dave, These magazines will not be able to ship to Upstate NY as NY state has a high capacity magazine restriction allowing only magazines 10 rounds or smaller to be sold in your state. 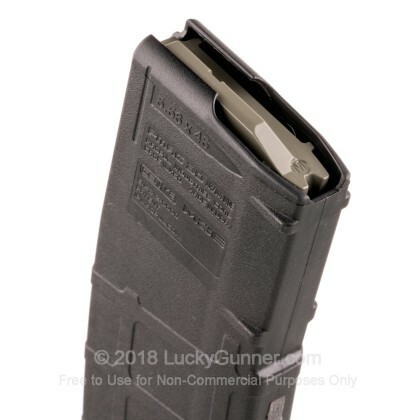 A: Hello Brent, These Pmags will work in any rifle that accepts standard AR-15 style USGI magazines. Q: Will these fit a Bushmaster AR-15 5.56 NATO? A: Hello Jeff, Yes, these 30 round magazines for an AR will work in your Bushmaster AR-15. You shouldn't have any problems with them.